This article was written by Frank Poma as a resource on common guardrail issues and solutions for building modernizations. Frank Poma oversees the operations of Poma Architectural Metals and is responsible for developing a number of the company’s patents. Poma Pin: Watch the video to learn how to install the best guardrail systems for condominiums. 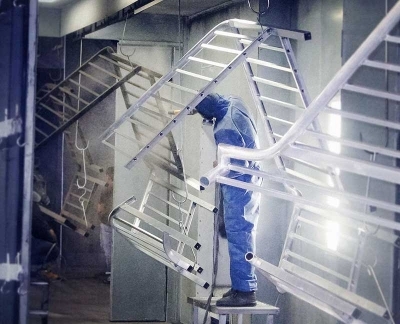 After 45 years in the aluminum handrail business and 15 years in concrete restoration, I have learned quite a bit about the problems that this industry faces. Billions of dollars are spent each year on repairing concrete balcony edges and replacing railing. The primary culprit is aluminum corrosion, which can not only damage the railing system, but also cause spalling and concrete failure to the balcony or floor to which it is installed. Aluminum corrosion most often occurs when aluminum is embedded in concrete in a harsh (beach or salty) environment. 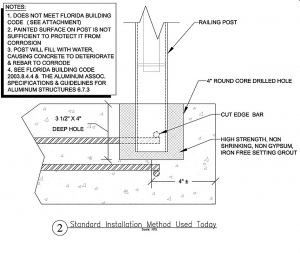 The most common railing installations come with a host of issues, and it all starts with coring a big hole for the standard 2″ post (see Drawing 1). Drawing 1: Typical problematic guardrail installation used today with wide coring required for embedded railing post. The wide coring hole results in damaged rebar/embedded structural steel in the concrete. To make room for this 2″ post, one must core drill a 4” diameter hole 3½” deep. This happens very very close to the edge of the slab. The post is then set in place by the use of hydraulic or gypsum based cement. 1. Steel reinforcement bars are placed at the edge of a concrete slab about 1½” to 2” from the edge causing it to be in the way when core drilling. The bar is cut every time a post is embedded into the slab. The core drill cuts and exposes the steel reinforcement bar, and upon placing the aluminum post, causes contact with the steel reinforcement bar causing electrolysis in which the aluminum corrosion, or aluminum rust takes place and the metal and expands. This in turn causes concrete spalling and the aluminum to corrode, rust or disintegrate. Example of a rail post failure, embedded directly in the concrete. 2. Gypsum based material used to set the aluminum post corrodes after time forming a pocket around the post causing saltwater intrusion to occur. The concrete becomes less alkaline and causes the reinforcement to expand (due to corrosion). Concrete sapling develops and hairline cracks occur which allows more saltwater to seep in and continue to crack and spall the concrete edge (just like a cancer spreading). Once moisture seeps into the pocket, the aluminum oxidizes and expands causing the concrete to spall further. Damage to the balcony’s structure becomes a life/safety issue when aluminum railings become loose or corrosion causes concrete spalling on the balconies. 3. The cementitious material used to set the aluminum post into the concrete slab comes in various specifications and each will react differently. 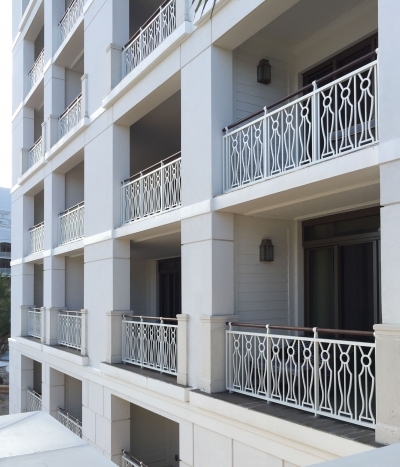 In some cases, it expands causing the balcony edge to blowout; in others, it will shrink allowing saltwater intrusion to take place causing a corrosive reaction between the aluminum and steel reinforcement bars. Some products are so alkalic, they corrode aluminum posts directly causing the aluminum to oxidize or rust and the concrete to spall. 4. The majority of aluminum railings being fabricated today are welded together. In that process, the bottom channel is welded to the post (see drawing 1) causing the aluminum handrail post to fatigue and change tempers. 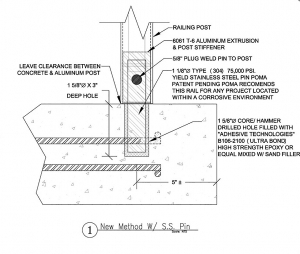 This causes the aluminum post to be weaker than a similar non-welded post; in some cases, this may actually cause the post to be weaker than the structural design strength requires. The extent of this weakening is a direct result of the individual welder applying a larger weld or of more duration, each of which will significantly decrease the temper of the post. 5. Most, if not all, aluminum posts allow water to seep through the joint between the post and the cap causing saltwater to lie inside the post and corrode or rust the core-drilled hole. This also causes further damage allowing the water to infiltrate into the edge of the slab adding to the problem of concrete spalling. 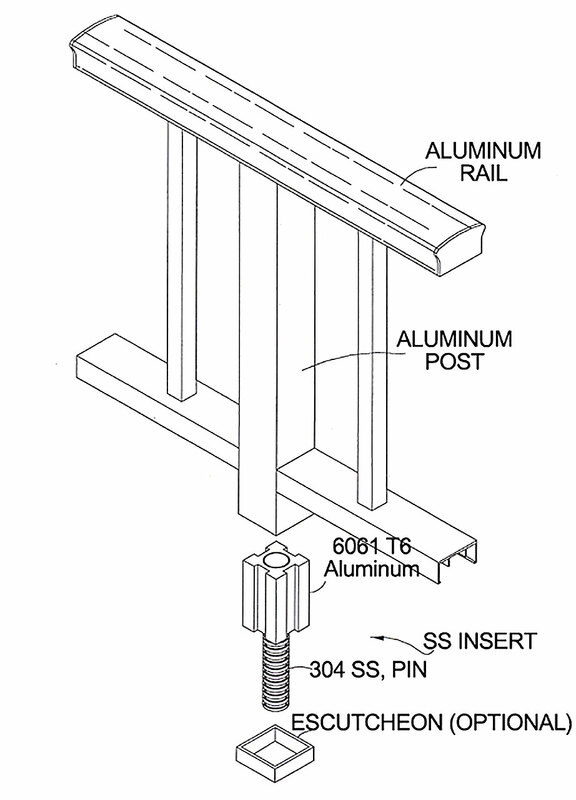 Drawing 2: Diagram of the Poma Pin method for securing guardrails. We developed a patented stainless steel insert which acts as a corrosion inhibitor that stops aluminum rust, aluminum corrosion, and concrete spalling. This is the Poma Pin, (Drawings 2 & 3), and it provides a much more simple and cost effective installation. 304 and 316 stainless steel are the only alloys that are compatible with aluminum and concrete. They can handle alkaline and acidic conditions in the most corrosive environments due to their low carbon contents. 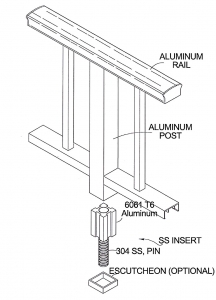 Drawing 3: Diagram of the Poma Pin method for securing guardrails. The Poma Pin is inserted between 2” and 4” inside of the post and can be set several different ways based on site conditions: it can be press fit hydraulically, glued, pinch-pressed, or set with a stainless steel set screw. The Poma Pin provides a corrosion free aluminum handrail, rust free railing system. This railing system stops concrete spalling, and minimizes or eliminates concrete restoration costs. 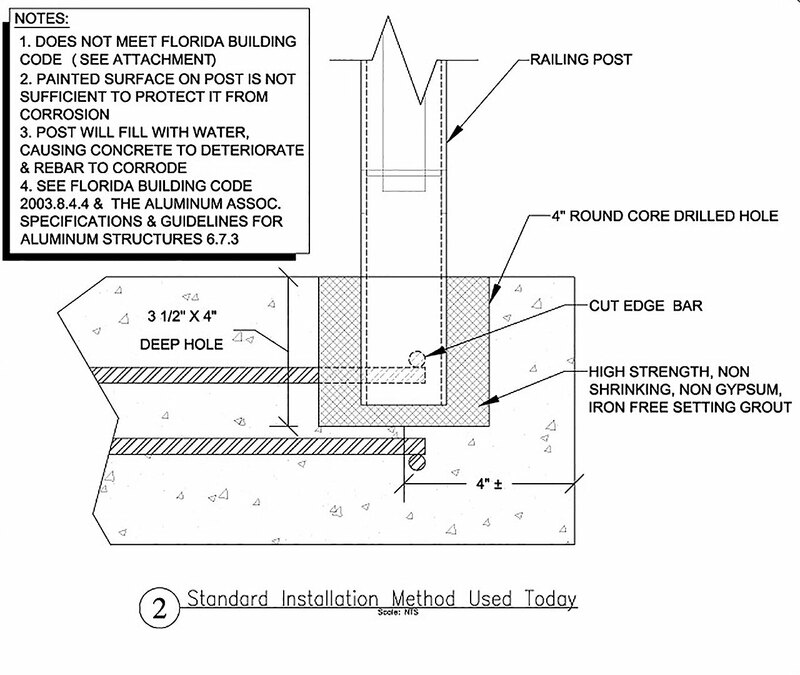 The hole drilled in the concrete balcony is 1” to 1½” in diameter, and 2” to 3½” deep depending on the load required at the post. By drilling such a small hole, you eliminate the need to drill or cut through the edge bar and most lateral bars placed in the balcony for reinforcement. The Poma Pin is placed and secured by using an epoxy or acrylic adhesive. The adhesive will not corrode or rust over time and is impervious to water. The adhesive material will not expand or contract with the concrete. The glue bonds with both the concrete and the Stainless Steel Insert. Both of these properties prevent saltwater intrusion preventing the affliction of problems 2 and 3 above. 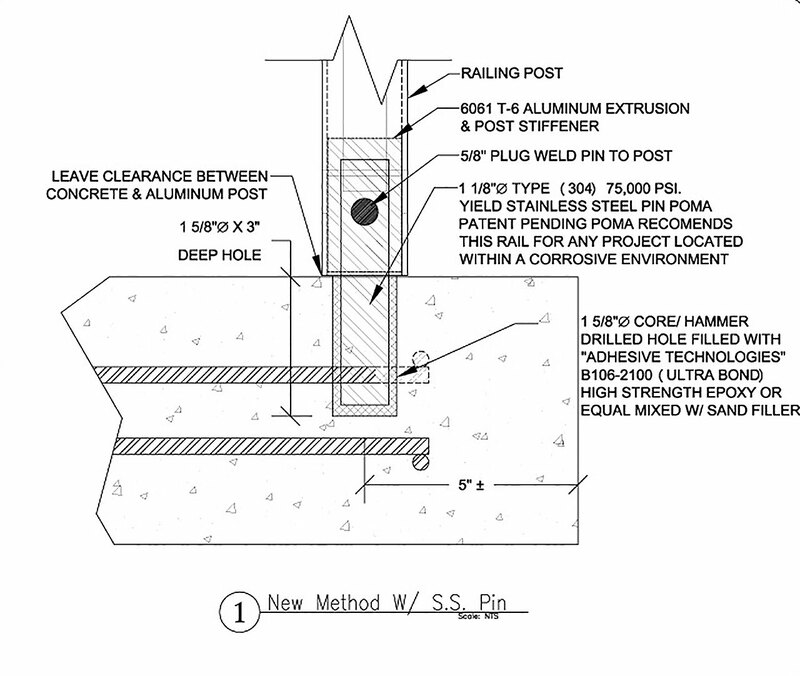 The inserted Poma Pin strengthens the bottom of the post where the channel is welded. The length of the insert-post embed is determined by the appropriate length needed to bypass the annealed area of the aluminum post. The Poma Pin has fins that allow moisture to escape from down the guardrail above it. The Poma Pin will not cause aluminum rust stains that are usually present with traditional core drilling methods. I hope that this information has been helpful. I feel very strongly that by using this system you will eliminate many of the problems associated with aluminum handrail corrosion, aluminum rust and concrete spalling. When modernizing your building, save money by using our state-of-the-art corrosion free aluminum railing systems and add to your bottom line. Make repairing concrete balcony edges & railing a thing of the past. If you have any further questions, please contact us at 866 550-7662 or complete our easy-to-use online form. Frank Poma oversees the operations of the company and is responsible for both financial control as well as determining profitability for future projects and opportunities. Responsible for developing a number of the company’s patents, Frank contributes a vast amount of knowledge and experience with over 40 years of construction related experience.